A little vinegary treat for Memorial Day weekend, courtesy of the Tax Foundation. Taxation is a zero-sum game. If, like Florida, you have no state income tax, you have to raise money somewhere, in this case with a "sin tax" on wine that is 10 times that of California's. Florida consumes the second-most wine in the US. Rise up, Florida wine drinkers! Of the big wine-producing states, Washington has the highest taxes, which can't help the local industry. There isn't much California and Texas have in common politically, but I'm glad we can break bread on this issue. I'd rather see sugary sodas taxed than wine -- oops, just lost Texas. Ah well, enjoy the map, have a nice holiday. Blake, I usually really enjoy your posts but in this case, I have to say that not only is the title a bit misleading but so is the article. I understand you want to attract readers and titles have to sell but the article didn't paint the picture correctly. Excise taxes are paid by the producer as the wine is brought out of bond. The Federal rate is $1.07, with a small producer credit of $.90, making it $.17 for many of us. The CA state rate we pay is $.20, all per gallon. So I'm not sure that $2.25 in Florida is relevant except in an alarmist sense. How much wine is made in Florida? Florida wine drinkers are not paying $2.25 per gallon to consume wine made in California. They are paying $.20! Unknown: I don't understand what you're talking about. Excise taxes are charged to producers trying to sell wines in Florida; of course they're passed on to the consumer. And I can't believe you're hitting me with the old "just trying to attract readers" complaint. Geez. Is there anything LESS attractive to readers than an excise tax map? Not that there's anything wrong with trying to attract readers -- that's what the media does. But come on, I hardly think you can call a tax map sensational. Excise tax is the tax levied on the winery when it removes wine from bond. In California I pay .20 to the state and then 1.07 or 1.47 to the Feds depending on alcohol level, minus the .90 small producer tax credit (which would apply to all wineries in all states). The rate of excise tax I, as a winery pay, is not conditional upon which state I end up selling the wine to. However, if I were to sell wine direct (not via a distributor) to another state, I should be keeping track of sales and paying sales tax to that state, but this gets us into the pandoras box of state-by-state compliance. 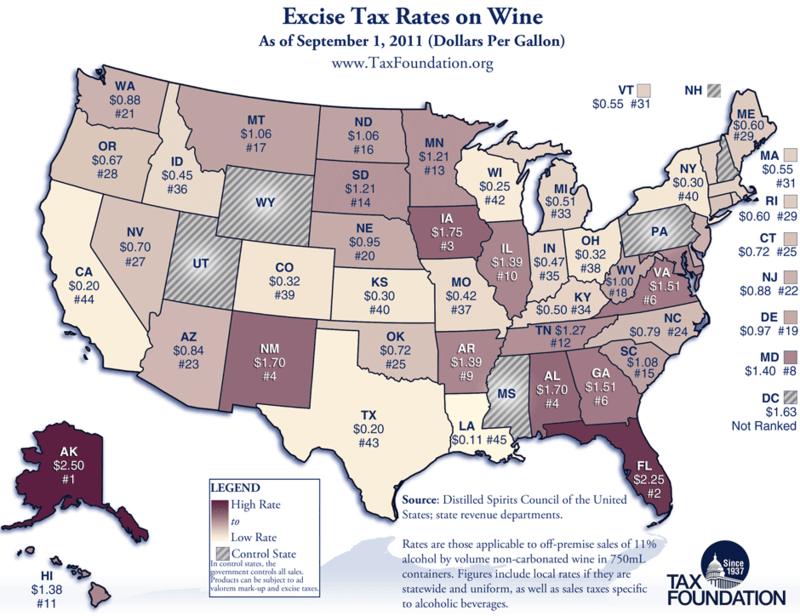 What this map indicates to me is that the small number of wineries in places like Florida have to pay their state a lot of excise tax which probably does influence their finished bottle price whether they are trying to sell the finished wine in Florida, Georgia, or California. Wine is taxed on the Federal level by the TTB when it is removed from bond ($1.07 and $1.57 per gallon not including the $0.90 tax credit for applicable wineries). At the same time the state of California (or home state) charges their version of excise tax (here in California $0.20 per gallon). However, if and when the wine is shipped out of California the wine becomes exempt from the California tax. Once the wine is shipped from the winery to the consumer outside of California, that state then charges the winery excise tax (Florida $2.25 per gallon). The winery absorbs that cost. Blake, I enjoy your columns. However, I think a bit of background would have been helpful to some. Sigh. Look, excise taxes aren't my specialty. I don't really know what the laws are. I got a cool map from what appears to be a reputable third party and ran it on my blog on a day when I caught two flights across the country. If there's some confusion here, I'm sorry for it. It's a holiday weekend and I checked the tax facts as well as I could on the Internet in my hotel room while on vacation. I guess I should be flattered that people expect more work from me than that, even for free. I'll take it as praise. So thanks. BTW, can I ask, if you know you're right about this, why do you have to be anonymous? I appreciate that you're essentially praising, not insulting, me. But I'll come clean here -- I don't know whether you're right or not. Excise taxes aren't my specialty, and it's not something easily researched on the Internet, I discovered Saturday. To clear it up, I'll have to ask somebody who knows the topic much better than me. That's what I'd do if somebody was paying me, and I wasn't trying to do what I thought was an easy and interesting AND noncontroversial or sensational blog post. So if you're Rick Tigner, and you say, "I'm Rick Tigner, and you're wrong," all I can say is, "Gee Rick, thanks for reading, and thanks for correcting me, on behalf of myself and my other readers. And by the way, loved you on 'Undercover Boss'." In fact, you may very well BE the expert I need to set the record straight. So why not just identify yourself? We're not talking about something controversial here. Help a brother out. I studied accounting in College, and i still don't get it. Can anyone break it down into real world, I'm the consumer paying $10.00 retail for my wine example? PS - don't know how to unmark me as 'unknown' and/or mark me as "justin". My apologies. I was unaware that I would come up at anonymous. I am a blog reader, not a blog commenter. My name is Drea Helfer (certainly not as impressive as Rick Tigner). I am a compliance consultant and have been for almost a decade. Compliance is complex and difficult to explain without writing volumes. I think the map is helpful. Quite helpful actually, but like all compliance the map alone isn't enough. Frustration for the rest of the world job security for us consultants. All right Drea, thank you, and thanks for reading. Can you do me a favor and answer Justin's question? How much would Florida's excise tax, for example, add to the cost of a bottle of, let's say, standard supermarket 100,000-case wine? Journalism by comment string! Another evolution. Thanks. There are some informative comments here and a good discussion is what any blog should strive to achieve. The lesson here, IMHO, is to do your homework and understand your topic before bending it in any direction to make a point. And this should apply whether you are being paid or not. After all, it's your integrity and credibility as a journalist and writer on the line. Tim: Please explain to me the direction in which I have "bent" this map. By the way, let me take the opportunity to give all y'all the right to say, "Hey, I paid $25 to you to help maintain this website. You need to put more work into it, slacker." Please see the donation box on the right side of the blog. Thanks! I think there is still some confusion here. State excise taxes are paid to the state by a licensed entity when it enters commerce. In the case of California wine, a wine producer would pay the Federal excise tax and the California excise tax if the wine was to be sold in California. If the wine was exported to Florida, the California winery would not pay the California excise tax. The Florida excise tax would be paid by the Florida license holder, mostly likely the wholesale-distributor. That tax, plus shipping costs from California, would add to the winery FOB and become the distributor's "laid-in" cost and part of the distributor's cost of goods. The Florida tax results in Florida consumers paying more for wine. The Florida tax is NOT paid by the California winery unless the California winery has a Florida license that allows direct shipment to consumers.